Microsoft released OneNote for Android tablets today with handwriting input, bringing Android users closer to the OneNote experience the company envisioned for the Microsoft Surface. When the Surface Pro 3 was announced, OneNote figured significantly into the release. Microsoft’s Panos Panay positioned the tablet as an effective digital inking device that even launches OneNote when users click the stylus. 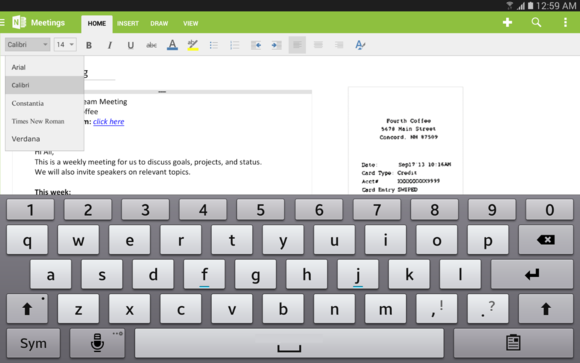 Once inside the app, users can mix and match typed notes and text, written annotations, audio, and images. And thanks to another update today, the Windows app can also import files such as PowerPoint documents and PDFs, as well as highlight text in notes and print them. 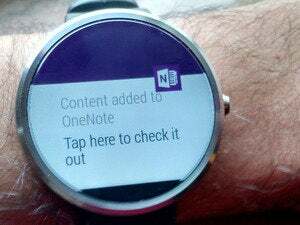 Many of these features have now been brought to the OneNote for Android tablet app. The addition of handwriting support is long overdue. Suddenly OneNote for Android feels like OneNote. I downloaded the app onto our Galaxy Tab Pro, a large Android tablet with roughly the same dimensions of the Surface Pro 3 and a stylus to boot. The OneNote app for Android includes an Office-style ribbon. Unfortunately, to format text, you need to click the text, then the "Home" tab, then apply your edits. You can’t perform the wake-on-click-the-stylus trick—clicking the button on the Tab Pro’s stylus brings up the familiar Samsung radial menu and nothing OneNote specific. But just the ability to type in a note, pull in an image, and then scrawl an inked note next to it is refreshing. You still can't import a PDF or PowerPoint presentation into the OneNote for Android app, but you can get around it with a quick snapshot or by exporting the files as JPEGs. By bringing new capabilities to its standard apps on various platforms at different times (Microsoft recently updated its Mac and iOS versions of OneNote, as well), it feels a bit like watching a horse race run by Windows, the Mac, iPads and iPhones, Windows Phones, and Android devices. Personally, it’s still frustrating to pull out a Lumia phablet and be forced to either type or dictate a quick note to myself because OneNote for Windows Phone hasn’t yet implemented handwriting support. We gave the Samsung Galaxy Tab Pro high marks for its productivity earlier this year, based on its large screen size and multi-window capability. 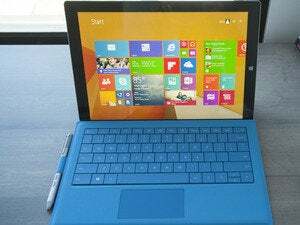 Now, Microsoft has given the Tab Pro and its competitors an additional boost. 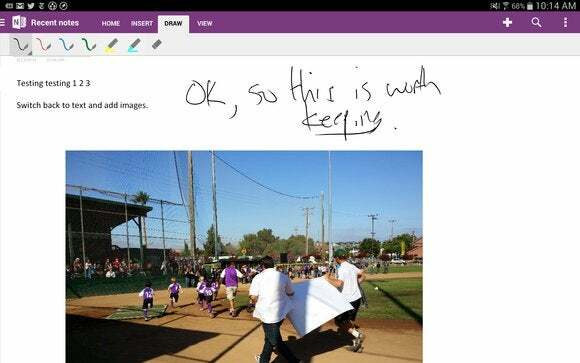 Microsoft’s OneNote for Android is available now in the Google Play Store. A previous version of this story incorrectly stated that Microsoft had upgraded OneNote for Android. It is a new app for Android tablets.